Group 2/3. 4 - 12 years old. DescriptionBritax Römer KidFix SL booster seat with backrest. Group 2/3. Strictly follow provided instructions for use. Forward facing installation from 15kg to 36kg. Easy installation with its ISOFIT soft latches or car seat belts. Intuitively positioned seat belt guides ensure a repeated correct positioning of the adult 3-point seat belt to maximise protection for your child. Deep, softly padded side wings provide Optimum Side Impact Protection. Lightweight for easy transfer between cars. V-shaped backrest – ensures a perfect fit throughout your child’s development. Height-adjustable headrest and belt guide allows the seat to grow with your child whilst keeping the adult seat belt in the correct position over your child’s shoulder. Softly padded washable cover keeps your child comfortable in their seat and can be easily removed for washing.Suitable for children aged 4 up to 12 year old (minimum 15kgs - up to 36 kgs). If you need to travel in France with a child older than 4 (and 15 kgs), the Römer Britax KidFix is ideal for you. 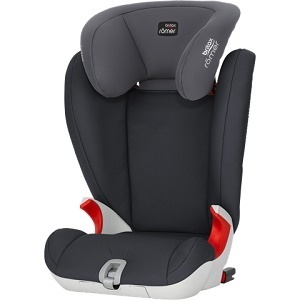 Comfortable for your child with its padded seat, easy to use -you'll simply need to put it in your car and follow the red belt guides at adjust belt correctly. Your child will travel safely during your stay in France, in Europe. This car-seat has been newly added to our range of baby equipment rentals. It has not been commented yet.